Saint Clair County, Illinois Horse Directory - O Horse! Full care riding and boarding facility. 80x200 indoor riding arena for year around riding enjoyment. Lessons also available. Boarding open 365 days a year. Home of Ride With Excellence. We are located on 800 acres in Illinois. We have over 10 miles of trails and lots of pasture space! We have an indoor/outdoor arena, a round pen, trainers on site 24/7, a farrier on site, stall or pasture board, and plenty of trailer parking. We offer summer camps, trail rides, riding lessons, pony rides, birthday parties, company retreats, and a great working student program. 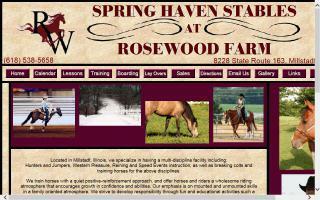 Spring Haven Stables is located 12 miles from downtown St. Louis and 18 miles from the JB Bridge in Millstadt, IL. We offer quality boarding and experienced trainers in a family friendly environment. Monthly rate includes morning and evening grain, hay three times daily, large stalls, daily turnout on pasture with hay quality round bales, and daily stall cleaning. Our facilities include a large indoor arena for year round riding, an all weather outdoor arena, a round pen, and on-site farrier and veterinarian services. We are a multi-discipline boarding facility with training available in: dressage, hunter/jumper, western pleasure, and reining. We offer riding lessons for ages 4 & up. Come tour our facilities, and speak with our facility managers and trainers. Every horse has moves he performs naturally in the wild. Whether he is escaping a predator or playing with herd mates, horses have what we call "basic maneuvers." These maneuvers can be performed by any horse. The move basics and move definitions will help the rider learn to communicate with his/her horse. If the rider better understands the mechanics and limitations of the horse, the rider's performance will greatly improve in his/her chosen discipline. The move basics will also improve performance for trail riding or pleasure horses. Learning how to better handle your horse will improve your safety and confidence around horses and other riders. Our training method is one of the fastest, easiest, simplest, and safest. After the roundpen... YOU can Ride with Excellence! Full service boarding and training facility with something to offer all ages and levels of riders. Briarstone presents beautiful facilities boasting indoor & outdoor arenas, matted stalls, and multiple tackrooms. Outdoor amenities include acres of rolling beautifully fenced pastures, a jump field, and trails. Briarstone Riding Academy offers training for the hunter, jumper, and equitation rider.